Harmonix and MTV Games' self-publishing tool for Rock Band songs is no joke. Judging from reports of impressions of the service, the Rock Band Network is a serious tool for professional use. The idea of the Rock Band Network might give rise to images of amateur musicians simply booting up a program, hitting a few keys and then selling their songs on the Rock Band Network store, but unfortunately (or fortunately), it's not going to be as easy as that. Judging from Joystiq's impressions of the service, this is a serious tool for professional musicians, and if not that, just people who are really dedicated to distributing their music in games, to use. By Harmonix's estimate, first-time users could take 20-40 hours just to craft a single song from start to finish. That's not altogether surprising when you consider that the company says that the Rock Band Network tools are essentially what Harmonix themselves use at their home office. Here's how it works, in a nutshell. You start off using a Rock Band specific plug-in for audio production suite Reaper (if you're already knowledgeable in producing music you'll need to learn this too, I'm guessing). In the Reaper interface you lay out note tracks for every difficulty, and the note sequences will show up in a chart and on a mock-up of the in-game screen in the top right. Once you've laid down the tracks, you can add audio manipulation effects with splicing, mixing and sampling, or use some pre-made scripts to add certain qualities to your song, like a script that makes the playable parts of a song more easy to hear when playing. Next you import the song into Magma, which will turn your data into a playable track, add things like camera angles and lip syncing, and let you add information about the track (title, artist, etc). From there you're good to go (if you're not on a Mac that is, Magma is PC-only) and the song can be uploaded onto the Network servers and be played and tweaked in Audition mode. Once your tune goes on sale, it has to reach a certain amount of sales before MTV starts sending you checks. Once those checks do start coming, they'll be made up of 30% of the revenue you pull in through sales - the rest will go to Harmonix and the platform holders. 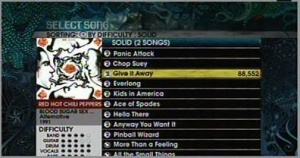 So there you go: if you're really serious about getting music onto Rock Band, that's how it'll go. Rock Band Network is in closed beta at the moment and will head into an open beta this fall.